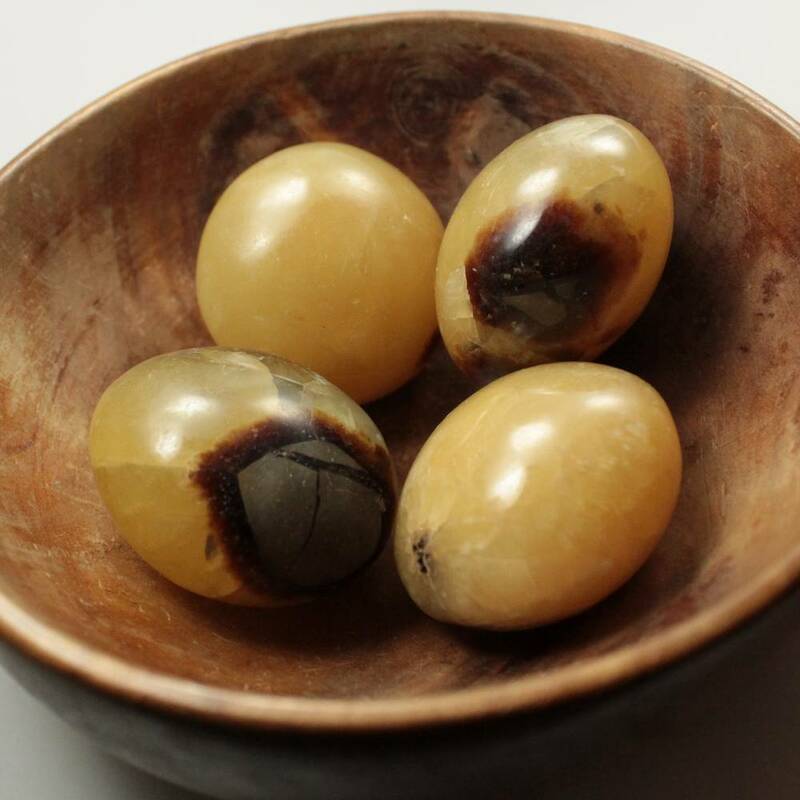 An interesting concretion formed of several different types of minerals, Septarians are usually cut and polished as a decorative object – although tumblestones are quite common too. Septarians are not a gemstone, and are actually a type of concretion, full of a range of different minerals. A series of cracks and cavities inside the concretion slowly fill over time with these minerals – they are usually mostly filled with calcite, but quartz, aragonite, limestone, dolomite, and pyrite can be found in some. The actual makeup of the stone depends on the location and the type of rock it was found in. They can vary wildly in appearance – there is usually an interesting pattern that almost looks like spiky thunderbolt shaped inclusions coming outwards from the centre of the stone. Sometimes druzy and individual crystals may be visible on larger pieces. These concretions can be up to three metres in size – there are some extremely large examples found on beaches in New Zealand, known as the Moeraki Boulders. They are also found near Zion National Park, Utah, as well as in Madagascar and Morocco. The name comes from the Latin word ‘septum’, meaning ‘dividing wall’ – likely a reference to either the stone wall which cracked and allowed the minerals to leach in, or the walls which hold the crystals in their unique pattern. 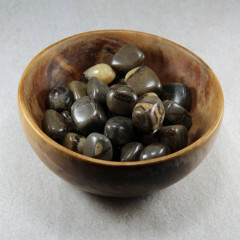 They are usually cut in half, or sliced into many thin slices to create an interesting display piece, when polished, or sold as tumblestones, palmstones, or spheres, etc. 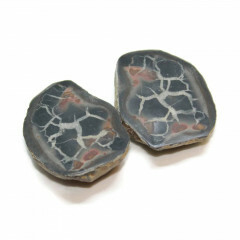 It is possible to find Septarian cabochons for jewellery, too, although the differing hardnesses of the various stones may make them difficult to cut. Septarians are not generally used for crystal healing, although some believe the stone would take on the attributes and powers of the minerals it is comprised of. This typically includes yellow Calcite, brown Aragonite, Limestone, and white or clear Barite. In folklore, septarians are also known as ‘Dragon Stones’. It is claimed that at some point, the dragons died, slowly fossilised into the sea bed, and later became the concretions we see here. The concretions are said to resemble the skin scales of the Dragons.